Herbert "Herb" Wallace Pepperdine 95 years of age, of Springhill, passed away on Friday, September 7, 2018 at the All Saints Hospital in Springhill . Born in Springhill, he was a son of the Late George and Rose (Brown) Pepperdine. Herb was a member of St. Andrews Wesley United Church, Springhill; he enjoyed the outdoors, walking in the woods, watching baseball and hockey. 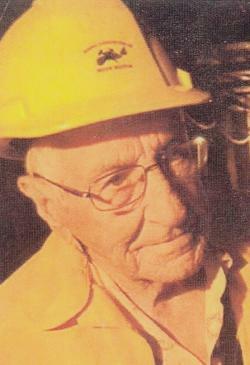 Herb was a coal miner all of his life. He was one of the miners trapped underground during the Springhill Mine Disaster of 1958; trapped under ground for 8/12 days before he was rescued. Herb will be sadly missed by his partner of 10 years, Elizabeth Martin of Springhill and her family; several nieces and nephews. Besides his parents, he was predeceased by his wife the former Dorothy Viola Spence; brothers, Bob, Burrell, Trueman, Clarence, Baker, Raymond, Kenneth; sisters, Annie, Ellen and Alberta. Cremation has taken place under the direction of A. H. Brown Funeral Home, 5 McFarlane Street, Springhill, (902 597 2361). A Graveside Committal Service will be held in Hillside Cemetery, Springhill, on Saturday, September 15, 2018 at 1p.m. with The Reverend Wayne McArther officiating. A reception to be held at A.H. Brown Funeral Home at 1:30p.m. If so desired, donations in Herb's memory may be made to the Heart & Stroke Foundation of Nova Scotia of the Nova Scotia Lung Association, choice. The family would like to extend a heart felt thank you top Dr. Short, the nurses on the 2nd floor of All Saints Hospital, the V.O.N. that looked after him at home and Beth Scammell. Sharing of memories and condolences may be sent to the family by visiting Herb's online memorial at www.brownsfuneralhome.com or through the A.H. Brown Funeral Home Facebook Page.